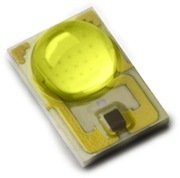 Lumileds has released the Philips Hue's lime-green (567.5 nm) LEDs in its Rebel ES and Luxeon Z lines. Some of them reach 200 lm/W. We have known for a while that one of the secrets behind the Hue's "16 million colors" is that it does not compose color out of red, green, and blue. Instead it uses what this review and teardown refers to as lime green (5 LEDs), red-orange (4), and violet-blue (2). This results in a gamut that is different than, and more limited than, sRGB. Now with the release of the technology it is calling simply "Lime," Philips Lumileds (sponsor of this site) reveals the Hue's composite colors to be in fact Rebel Red-Orange, Rebel Royal Blue, and the newly released Rebel ES Lime. So now others can make imitations and knockoffs of the Hue that will share its color gamut and its efficacy. And I daresay that many will do so. The Hue has stood out from its color-adjustable competition by its relatively high efficacy. Of course the main point of products such as Hue is not to save energy; it is more about setting and enhancing mood. But, if the measurements done by the Hardware.info reviewer (linked above) are to be believed, at several points along the blackbody spectrum the Hue manages from 95 to 117 lumens per Watt. That's not bad for an ordinary white-light LED source, but in one as versatile as the Hue it's pretty surprising. The press release announcing Lime helps to explain this efficacy. Lime emits light with a peak at 567.5 nm, which is close to the peak sensitivity of the human eye (at 555 nm). Since the lumen unit is built around the human sensitivity curve, we can expect that an LED near this peak to show high efficacy. Lumileds elaborates, "Because Lime is closer to the blackbody curve than green LEDs, much less [of the] inefficient red [light] is needed to make white light with Lime instead of green, especially at warmer color temperatures." Lumileds claims that using the Luxeon Z parts including Lime, white light from 2250K to 2950K can be produced at over 90 lm/W while keeping both CRI and R9 above 90. "When using a similar combination of Red, Green, and Blue LEDs to create 3000K white light, the CRI is close to 20," Lumileds writes. Perhaps you have noticed that the current flash poll, over there on the right, went a little crazy beginning on the morning of February 13. The poll asks: "Who will be the first to offer commercial quantities of 200 lm/W LED parts at prices luminaire designers are willing to pay?" The possible answers include Lumileds and Cree. By that question I meant white LEDs, more particularly warm white, but obviously didn't spell it out. On the morning of February 13, after the poll had been up for several days, some 35 people had responded to it, and Cree was ahead of Lumileds by 12 to 5. By early afternoon the total of respondents had broken 100 and Lumileds led by 77 to 15. It's now a rout, with 168 respondents and Lumileds over Cree by 121 to 26. Suspicious minds might wonder whether someone was gaming our very unscientific poll. My own suspicous mind was triggered by a comment on the poll from community member and blogger Ron Amok, on Tuesday, after the Lime announcement had hit the wires: "So, a badly worded poll question, which meant white LED, and we're at 200 lm/W today." But I am assured by credible sources that no gaming of the poll took place; merely that it got passed around social media and a lot more people voted, unrelated to the impending announcement of a lime-green, 200 lm/W LED.